Coconut oil tends to be in solid form when stored in room temperature. 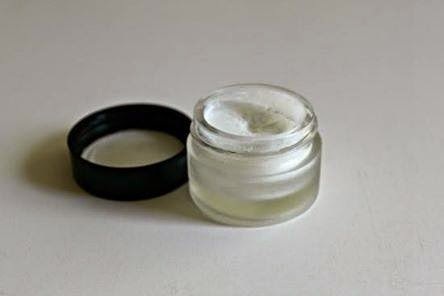 So, you need to liquefy the coconut oil by putting 2-3 scoops of tbsp into a microwaveable bowl and pop in microwave within 10 seconds until it starts to melt (you can adjust the amount of coconut oil depends on the size of container to use for storage). After that, puncture or cut 5 – 8 capsules of Vitamin E oil (I used 5 capsules for 1 oz jar) and add these to your melted coconut oil. Blend them well and put the mixture inside the fridge to solidify the cream, once it becomes solid, there’s no need to keep it refrigerated as the oils will not turn rancid. Apply the cream morning and night..